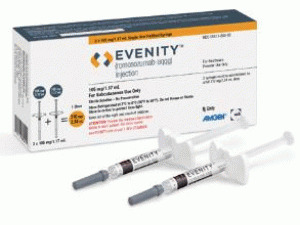 U.S. Food and Drug Administration (FDA) has approved EVENITY™ (romosozumab-aqqg) for the treatment of osteoporosis in postmenopausal women at high risk for fracture. EVENITY is the first and only bone builder with a unique dual effect that both increases bone formation and to a lesser extent reduces bone resorption (or bone loss) to rapidly reduce the risk of fracture. A full course of EVENITY therapy is 12 monthly doses administered by a healthcare provider.2 Since osteoporosis is a chronic disease, continued therapy with an anti-resorptive agent should be considered once EVENITY therapy is completed. FRAME (Fracture study in postmenopausal women with osteoporosis) is a randomized, double-blind, placebo-controlled study (Study 1) that eva luated 7,180 postmenopausal women with osteoporosis. The study eva luated the efficacy of EVENITY treatment (210 mg administered monthly), compared with placebo, in reducing the incidence of new vertebral fractures through 12 months. The study also eva luated the efficacy of treating with EVENITY for 12 months followed by denosumab for 12 months, compared with placebo followed by denosumab, in reducing the incidence of new vertebral fractures through 24 months. ARCH (Active-controlled fracture study in postmenopausal women with osteoporosis at high risk of fracture) is a randomized, double-blind, alendronate-controlled study (Study 2) of EVENITY in 4,093 postmenopausal women with osteoporosis and previous fracture history. This event-driven study eva luated 12 months of EVENITY treatment (210 mg administered monthly) followed by at least 12 months of alendronate treatment (70mg), compared with alendronate treatment alone, to assess its efficacy in reducing the risk of clinical fracture (non-vertebral fracture and symptomatic vertebral fracture) through the primary analysis period and the incidence of new vertebral fracture at 24 months. During EVENITY™ treatment, patients should be advised to report new or unusual thigh, hip or groin pain. Any patient who presents with thigh or groin pain should be eva luated to rule out an incomplete femur fracture. Interruption of EVENITY™ therapy should be considered based on benefit-risk assessment.